Seventeen-year-old Briony Larkin knows she's a witch - her stepmother told her so, and she knows that because of this, it is her fault that her twin sister is, well, the way she is, and that a flood nearly destroyed their house, and that she is also responsible for her stepmother's death. She can communicate with the Old Ones who live in the swamp, and if anyone in the village finds out, Briony will be hanged as a witch. She can feel the rope around her neck every time she thinks of it. As the story unfolds, the reader becomes aware that there is more to the tale than meets the eye, and as bits and pieces of the past are skillfully woven into the narrative of the present, the startling and disturbing truth of the situation is gradually revealed. What a wonderful book this was! 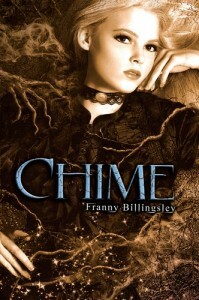 I originally picked up the audio book when I learned Chime had been nominated for a National Book Award, and then I found out that this audio version won the Audiofile Earphones Award - and it certainly deserves it. Susan Duerden's narration is delightful; it fits the evocative and atmospheric tale just perfectly, and the rich language and sensory details of the narration make me remember the book as though I've seen the film version. It is that vivid. Unforgettable characters, powerful supernatural elements, disturbingly creepy villains, a swoon-worthy romantic hero, and a complexly woven, moving tale make this one of my favorite books of 2011. This sounds brilliant. The author sounds familiar to me but I can't place her. Oh, I just looked her up, she wrote "The Folk Keeper"! A book I simpley adore! Will see if my library has this one. I really enjoyed this book, too. I read it a bit earlier in 2011 and had fun with it. Wow, this is a heavy hitter if it's an NBA finalist and winning all sorts of audio awards, too! I admit the story itself doesn't really draw me in, but your review and the finalist for the national book award certainly do!